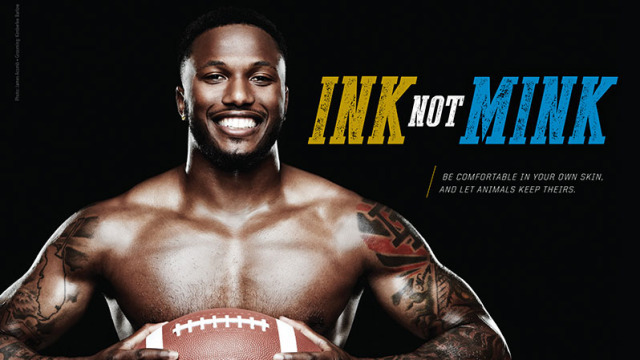 Chargers cornerback Brandon Flowers in his photo shoot for PETA’s anti-fur athletes campaign. Photo Credit: James Acomb. San Diego Chargers cornerback Brandon Flowers has joined an illustrious group of NFL players that are apart of PETA’s anti-fur athletes, that look to seek awareness on the devastation animals suffer for their fur. The ad campaign comes at a very timely part of the year, as fur products are in high demand around the holiday season. Other NFL players who are also apart of PETA’s campaign include Tony Gonzalez, Terrell Suggs, Stevie Johnson, Antoine Bethea, Le’Veon Bell, Willis McGahee, Bret Lockett, Maurice Jones-Drew and Aaron Curry.